If you think that computer based greenhouse control systems are expensive, the Growmate line of products will enlighten you. 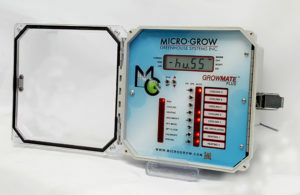 An affordable choice for many growing operations, the Growmate Plus puts the power of a microprocessor based control system in your hands at a price that anyone can afford. All temperature settings can be adjusted independently for day and night heating and cooling, as well as DIF settings. A large and informative display assists in programming, while providing a constant readout of all sensors. Manual override switches for all outputs are conveniently located on the front panel. Growmate Plus includes a temperature sensor and photocell. An optional humidity sensor is available for accurate and true dehumidify functions. Low voltage 24 VAC operations.